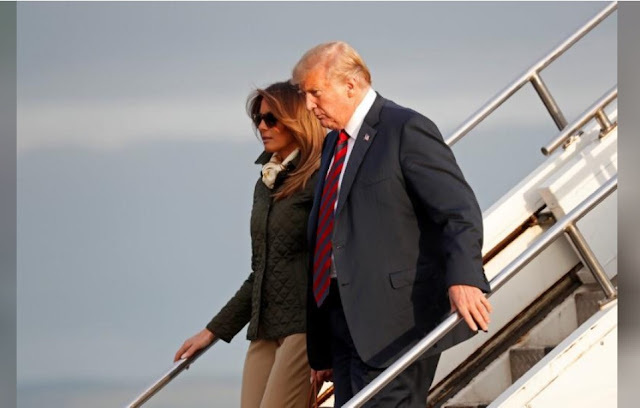 U.S. President Donald Trump said on Saturday he hoped to play golf at his course in Scotland ahead of a summit with Kremlin chief Vladimir Putin that could be overshadowed by accusations that Russians meddled in the U.S. 2016 election. In an uproarious trip to Europe, Trump harangued members of the NATO military alliance, scolded Germany for its dependence on Russian energy and shocked Britain by publicly criticizing Prime Minister Theresa May’s Brexit strategy. Trump apologized to May for the furore over his withering public critique, blaming “fake news” and promising instead a bilateral trade agreement with Britain after it leaves the European Union in March. After meeting the queen at Windsor Castle, Trump headed to Scotland, where his mother, Mary Anne, was born and where he owns a golf course, before his Monday meeting in Helsinki with Putin. While at his Turnberry course on Friday evening, an activist for the Greenpeace environmental campaign group swooped on a powered parachute within a few hundred yards of the president as he stood outside the golf course’s hotel. After tens of thousands of people marched peacefully against Trump in central London, more protests are planned on Saturday. A blimp depicting Trump as an orange, snarling nappy-wearing baby was due to be raised at a park in the Scottish capital. “I don’t want him polluting our country like he’s polluting America. I’m ashamed that his mother was Scottish,” said Annette Johnson, 61, who joined protesters on a beach in Turnberry. Some supporters of Trump will also march in London. British Trade Secretary Liam Fox said anti-Trump protesters were “an embarrassment to themselves” as they had shown bad manners to the leader of the free world. In the most detailed U.S. accusation to date that Moscow meddled in the presidential election, a federal grand jury said Russia’s military intelligence agency officers covertly monitored computers of Clinton’s campaign and Democratic campaign committees and stole large amounts of data. The charges shine an even greater spotlight on Trump’s treatment of Putin, who has repeatedly denied Russia sought to intervene or skew the U.S. election that Trump, a Republican, unexpectedly won.